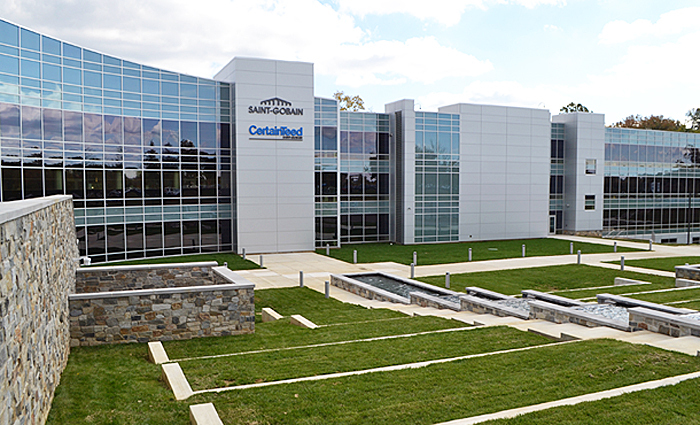 The headquarters is located on a 65–acre suburban site, which previously contained two existing four-story buildings joined by a four-story connecting link. The project was completed in two phases: core and shell and interior fit-out. The core and shell project included major renovation of the existing building, with a 40,000-square-foot addition expanding the existing link. The existing structural system has been maintained and reused in the new design. About 15% of the project is classified as new construction and 85% as renovation. The project achieved USGBC's LEED Platinum certification for both Commercial Interiors and Core and Shell. Another major goal was to provide a high-performance, healthy work environment. The interior design minimizes barriers and utilizes flexible configurations to encourage collaboration. The south and west façades utilize Saint-Gobain's SageGlass dynamic glass, which tints on demand to adapt to the sun's intensity while providing access to natural daylight and outdoor views and preventing glare and heat gain. The headquarters' design has changed employees' lives. Whether it is the 116 collaborative meeting spaces, 800+ workstations all with outdoor views, open executive offices, an acoustically sound cafeteria, and an industry-leading fitness facility, this building is designed to meet the needs of a dynamic workforce. Accessible Goal: The renovated building was brought to ADA compliance through the addition of lifts, lowered placement of appliances, and updated faucets and toilets. The main entrance has ADA-compliant doors and turnstiles to provide wheelchair or scooter access. The company invested in three scooters for employees and visitors who need assistance. Adequate ADA parking was assigned, and the parking lots were resurfaced to meet ADA requirements. Aesthetic Goal: The team was challenged to create an iconic building that would demonstrate the company's mission and values while using its own building materials to create a next-generation workplace that is both comfortable and sustainable. White reflective surfaces are utilized to bounce natural light around the space, and bright colors are utilized to bring the space to life. Cost-Effective Goal: It was very important for the headquarters to serve as a "living laboratory" where Saint-Gobain's research team can measure the impact of its products. The interior fit-out design scope focused on maximizing the use of Saint-Gobain's innovative products, from high-performance ceilings to VOC-reducing drywall. The building includes Saint-Gobain's SageGlass dynamic glazing, which reduces solar heat gain and glare and maximizes daylight and outdoor views. Saint-Gobain collected Environmental Product Declarations and Health Product Declarations for a number of the products utilized to ensure the company was using sustainable building materials with a positive impact on occupant well-being. The project included a focus on integrated energy-saving strategies such as occupancy sensors to control both lighting and HVAC and daylight dimming and high-performance LED lighting, which resulted in significant savings for the owner. Functional Goal: The headquarters was designed to foster cross-team collaboration, and the new space has become a showcase of how the company's products, systems, and solutions make a material difference in how people work. The company surveyed its employees about what they would like to see in the new office space. Employees said they were nervous about an open-plan office, so Saint-Gobain asked the architects to triple the number of collaborative spaces and other private, casual work areas. The project is a total of 277,000 square feet, including 119,000 square feet of open office space. The building has 116 collaborative spaces of various sizes to meet employees' needs. The outdoor landscaping allows for employees to work outside. Wi-Fi is installed throughout the building interior and exterior to promote movement. Ninety-three percent of the spaces in the building have access to outdoor views and natural light to help promote well-being and productivity. Productive Goal: The design teams were asked to create a workplace that fostered well-being by maximizing the comfort and health of employees and breaking down barriers to encourage employee collaboration. Saint-Gobain's Sales Support Group increased lead-generation performance 150%, compared to the same period in 2014. The employees demonstrated higher energy levels (attributed to air quality/lighting), increased collaboration, peer support and accountability, and even heightened competitive spirit (attributed to open floor plan) and greater focus with less distraction (attributed to exceptional acoustics). Pre- and Post-Occupancy Surveys indicate that overall feelings of well-being have significantly improved since moving into the new headquarters. Secure/Safe Goal: Safety and security were integral aspects of the design process as Saint-Gobain moved its North American security operation from Worcester, Massachusetts, to Malvern, Pennsylvania. Technology was installed to monitor the campus from the security office. Callboxes were installed in parking lots for emergency situations, and cameras were installed to monitor all building entry/exit points. The building is wired with an intercom system, allowing the security team to communicate with occupants during emergencies. The elevators and doors that separate the tenant space from the outside were programmed to lock down. Impact-resistant film was installed on the security/safety windows. Emergency evacuation routes were created with identified rally points. "Safe Zones" were identified in case of a weather situation or active shooter. Safety and security orientation was conducted the first day of occupancy, and further communication and training is regularly provided. First Responder training is provided quarterly, and once certified, these individuals are identified by workstation signs. AEDs and First Aid Kits were installed and are identified on the wayfinding. A full-time employee security team monitors the property 24/7. The security office is wired with a Plain Old Telephone Service (POTs) line in the event that servers are breached. Sustainable Goal: The headquarters was designed in close consultation with local sustainability consulting firms. In addition to LEED Platinum certification, the headquarters is pursuing the Environmental Protection Agency's ENERGY STAR® certification. The integration and optimization was focused around both energy performance and indoor environmental quality metrics. Energy optimization was achieved through extensive energy modeling highlighted in other sections of this nomination. This modeling allowed the designers to adjust the window-to-wall ratio of the project to balance the use of opaque and transparent elements with energy demand and daylighting. The qualities of building surface albedo and resistance to energy flows were considered in concert to better predict what would be experienced by occupants. Initial as well as aged surface values were employed to capture a realistic representation of the building as it ages. Various daylighting models and design iterations were performed in order to maximize the penetration of natural light into the space while reducing glare and other light-related nuisances. Changes of interior finishes have been made in order to understand their impact on daylight penetration and glare, as well as what other changes might need to be made to compensate, such as changing the algorithm controlling the electrochromic glazing. Saint-Gobain was approaching its 350th anniversary, and the company's headquarters was outdated, created silos, and inhibited collaboration. Saint-Gobain partnered with designers to solve challenges related to its real estate and to create a workplace that promoted the company's goals of showcasing innovation, breaking down barriers, and inspiring and promoting well-being. Utilizing a workplace engagement process of discover, assess, and inform, working teams were guided through an exploration process that allowed employees to become project stakeholders. The Building Steering Committee visited many corporate headquarters to assess office space design variety, ranging from traditional office perimeter with open office space in the interior to a fully open work environment. They evaluated the lessons learned by other organizations, which guided them to the decision to fit out an open office with abundant meeting/collaborative spaces. Working teams were created to assist with other decisions, including office furniture, the fitness center, conference scheduling software, and vendor selection. Working teams surveyed the employee base to determine which furniture would be used in the new office environment, from task chairs to workstations, and cafe seating. A Fitness Center Working Team surveyed employees to determine preferred equipment and classes, and created inspirational branding and incentives for promoting membership. Of the 800 employees in the building, more than 45% have a fitness center membership. In order to keep sustainability goals on track, the Sustainability Consultant met with the Construction Manager on-site each month. They reviewed submittal and documentation requirements and discussed sustainability procedures, such as construction waste management, indoor air quality management, and soil and erosion control. Saint-Gobain also implemented a green housekeeping program that utilizes environmentally friendly cleaning materials and equipment that help sustain the high level of interior air quality. Additionally, Saint-Gobain created an education program for employees and guests to learn about the lessons the company learned as it pursued sustainability initiatives for its headquarters. Pre- and Post-Occupancy surveys were completed. The Pre-Occupancy survey was completed more than one month prior to the move to Malvern from the Valley Forge, Pennsylvania, headquarters the company had called home for more than 40 years. The first Post-Occupancy survey was conducted one year after move-in. Both surveys were conducted by the University of Oregon's High-Performance Environments Lab. Building performance of the old campus and the new building (pre- and post-renovation) was measured by the University to quantify the comfort and effectiveness of the building materials utilized. Measurements for thermal comfort, VOCs, light harvesting, and acoustics have been gathered. The survey project is ongoing, with the second Post-Occupancy survey currently underway. All data and research will be compiled and published in 2018. Accessible: After extensive surveying of existing employees, the company invested in a shuttle service to provide employees with access to regional rail, Amtrak, and multiple bus lines. Aesthetic: The design includes the use of ceilings only where necessary and eliminates column enclosures, celebrating the exposed steel structure. This design emphasizes the company's building materials as well as reduces the amount of materials required to finish the space. Cost-Effective: The original 1960s design utilized fixed tinted glazing suspended as a shading device. Using innovative new technology, the new cladding provides the same protection when needed, but opens up to full clarity when direct solar glare is not an issue. In addition, the new envelope offers significant performance enhancements to eliminate thermal bridging. Functional: Flexible workplace planning allows for reconfiguration over time. A modular demountable wall system reduces reconfiguration time and waste. Productive: Open, collaborative areas with different furniture groupings allow for activity-based working groups - allowing for reconfiguration from project to project. Sustainable: Electrochromic SageGlass was incorporated into the perimeter glazing at key locations to minimize solar gain and maximize daylight-harvesting opportunities. This glazing can be programmed to tint in multiple ways. Careful tuning of the envelope to each specific orientation allows the dynamic glazing to be further tuned over time. Minimizing external loads is achieved through improved roof and wall performance, along with the electronically tintable dynamic glazing, SageGlass. Daylight sensors are located along the perimeter of the building to measure incoming daylight levels and modulate the glass transmittance according to interior needs. SageGlass provides beneficial daylighting and views to the exterior, while reducing uncomfortable glare and solar heat gain. Minimizing internal loads is achieved through the specification of energy-efficient LED lighting throughout, as well as ENERGY STAR equipment and appliances throughout the facility. Overall lighting power density is reduced more than 40% below ASHRAE requirements. The energy simulation software used for this project has all capabilities described in either section "G2 Simulation General Requirements" in Appendix G of ASHRAE 90.1-2007 or the analogous section of the alternative qualifying energy code used. Energy simulation runs for both the baseline and proposed building use the assumptions and modeling methodology described in either ASHRAE 90.1-2007 Appendix G or the analogous section of the alternative qualifying energy code used. An integrated design and construction team was critical to achieving the project's sustainability goals. The team completed a LEED charrette in schematic design to review sustainability goals. Participants in the charrette include owner, tenant, core and shell, and interior fit-out design teams, sustainability consultants, building science professionals, and the construction team. The integrated team developed a schematic energy model to determine base energy savings and then developed 16 energy conservation measures to review in more detail. Each iteration of the energy model determined energy cost savings above a code-compliant baseline, hard construction cost impact and mechanical sizing impacts. These tools were used to select the energy conservation measures that best aligned with corporate sustainability goals, budget and schedule. This assessment contributed to the superior energy savings on the project as well as the project's LEED Platinum certification. The company pursued ENERGY STAR's Designed to Earn certification. The company pays energy costs for the entire building and site in order to track ongoing energy performance in ENERGY STAR Portfolio Manager. Approximately 17,000 square feet of SageGlass dynamic glass is installed on the western and southern elevations of the façade and plays an integral role in helping the company achieve its sustainability goals, while creating a next-generation workplace that puts employees' comfort first. The dynamic glass was selected for its ability to dynamically control sunlight, to optimize daylight, maintain outdoor views and enhance comfort by preventing glare and solar heat. By controlling sunlight, it dramatically reduces energy demand and the need for HVAC, while increasing employees' comfort. Specifically, the electrochromic glass incorporates zoned technology so it can have three different zones of tinting within one pane of glass to maximize daylight and allow employees to comfortably enjoy unobstructed views of the outdoors, which have been proven to boost productivity and satisfaction in the workplace. A double silver-coated high-performing solar glass is used in most of the building's common-area façades, providing an optimal light-to-solar gain ratio in summer months and excellent thermal comfort during cooler periods, thus reducing both cooling and heating loads. Interior finishes and furnishings installed in the building were specified to contain little or no VOCs. For example, low-emitting products used included adhesives, sealants, paints, coatings, flooring, composite wood and furniture. Reducing the amount of VOCs entering the building provides a safer and healthier environment for building occupants. To help contain unwanted crosstalk, air rush, equipment noise, moisture buildup and energy loss in the building, duct liner and duct wrap are used throughout all HVAC systems to improve acoustic performance, indoor air quality and employee comfort. Sustainable fiberglass R–13 and R–19 batt insulation were used to create an environment that is quiet and comfortable and conserves energy and resources. Gypsum wallboard that removes VOCs from the air was used in interior walls, improving indoor air quality and promoting healthier living and work environments. Noise-reducing gypsum wallboard is also used to help reduce noise where acoustic management is needed. In areas of the headquarters where tile bonding is required, particularly in kitchen and bath areas, a tile backer is used for superior moisture and mold resistance and durability. After outgrowing its Valley Forge, Pennsylvania, location, Saint-Gobain relocated its North American headquarters to Malvern, Pennsylvania., where the headquarters combines office functions across the country into one location. The landscape design intent is to tread lightly, gently replacing invasive plants with natives and working to maximize views from the building to the existing woods, while tying into the existing ecosystem. More than 30% of the site is planted with native plantings. The existing pond was restored to deter geese and reduce a potent source of pollution. The original building was bridged over an active stream, and the new design restores that stream and includes prominent water elements. The main entrance features tiered lawn areas with a cascading waterfall feature. Select landscape areas at the main entrance are irrigated, but a majority of the site is not. The irrigation system and the water feature utilize harvested rainwater, thereby reducing potable water use by 100%. Rainwater is collected from a 7,000-square-foot roof area and stored in a 25,000 gallon cistern on-site. The site is located in the tributary areas of Valley Creek, so a comprehensive stormwater management plan was implemented on-site. The site is equipped with an underground stormwater detention system, infiltration trench and four rain gardens. The intent is to infiltrate on-site and prevent pollution of local waterways. The local climate in this region (4A) is mixed, with cold winters and hot, humid summers and a reasonable economizer season. The existing building orientation offered one wing with major east and west faces. Minimizing external loads is achieved through improved roof and wall performance, along with electronically tintable dynamic glass. This was installed along the southern and western facades, but omitted at areas with sufficient tree cover for protection against summer solar heat gain. Daylight sensors are located along the perimeter of the building to measure incoming daylight levels and modulate the glass transmittance according to interior needs. Sensors also control the interior lighting according to incoming daylight. Working in concert, the SageGlass and lighting controls provide a customized interior daylighting solution as well as moderate thermal comfort at the perimeter. Given the existing orientation, the space planning puts key program elements close to the exterior, with a buffer zone of circulation to temper peak gains and losses through the improved envelope. The preserved and restored deciduous tree stand at the eastern face of the building protects against overheating in summer, but allows for morning pre-heating of the space with beneficial heat gains offsetting morning heat requirements. Developing a planning concept to respond to the guiding principles of the project was essential. The space features fundamentals such as maximum daylight for all employees, a sense of collaboration and community throughout the building, effective space utilization that allows the sense of privacy in a 100% open plan environment, and glass-enclosed interior huddle spaces that serve as private meeting spaces. The layout was set up to provide multiple lines of sight to the exterior from the majority of workstations. Although glass fins above workstations precluded achievement of the LEED credit for Views, the low workstation heights allow for 94% of regularly occupied spaces to have at least one view of the exterior. Each workstation is outfitted with task lighting to accommodate individual controllability. The interior design includes a range of multi-occupant spaces, ranging from smaller phone booths to large conference rooms. Multi-occupant spaces are equipped with carbon dioxide sensors to modulate the HVAC system according to space demand. In addition, they are equipped with lighting controls to manage daylight, adjust light levels and automatically turn off lights when the space is not in use. Monitoring carbon dioxide sensors ensures healthy indoor air quality and increased productivity. In order to meet corporate sustainability goals under its internal programs, the company established rigorous energy-efficiency goals. The core and shell design includes: improved insulation in walls and roof, light-colored roofing, high-efficiency glazing, argon gas-filled insulated glazing units, and high-performance aluminum curtain wall systems. The Design Team selected high-efficiency glazing from the client's product offerings. Additionally, the dynamic glass modulates throughout the day according to changing sun conditions, thereby reducing solar heat gain. The Design Team selected high-performance heating and cooling equipment to balance thermal comfort and energy efficiency. Also, LED lighting is specified throughout the building and on-site. The new headquarters achieved 44% interior connected lighting power density savings above code compliance. Multi-occupant spaces include interlocking controls to reduce inefficient and wasteful practices. Lighting occupancy sensors work in concert with the HVAC system to set back temperatures when rooms are unoccupied. Also, SageGlass and daylight harvesting provide synchronized interior daylighting solutions. The new headquarters is a living laboratory to test the impact of Saint-Gobain buildings and allow the company to make continuous improvements. The company is partnering with the University of Oregon to compare occupant satisfaction in the old and new headquarters. The study included a series of surveys and site visits in the old facility. The University measured quantitative building data, such as lighting levels, acoustics, and ventilation airflow and surveyed employees to determine health and comfort. Lastly, the University collected corporate-wide data on productivity and absenteeism. Once Saint-Gobain moved into the Malvern headquarters, the research team returned to measure these values again with the same staff, but in the new building. The intent is to verify sustainable strategies with the greatest positive impact on occupant health and return on investment. The research team is currently tabulating the results. The company regularly surveys employees to determine satisfaction with the free shuttle service to the local train station and uses this information to tailor the program to suit occupants' personal schedules. Early in the design process, there were cost concerns about the innovative strategies proposed for the building, such as SageGlass and photovoltaics. In the end, the company chose to install these products to protect the health and well-being of occupants, save energy costs and align with corporate goals for reduced greenhouse gas emissions. The core and shell project was owned by the developer, who was using his assigned General Contractor that works on his other projects. The company hired a Project Manager to oversee the project on their behalf. There was a weekly construction meeting that included the PM; the GM and construction supervisors for both projects; sustainability consultants; security consultants; designers and architects; as well as company representation for technology, security, safety and change management. One of the main priorities of the project was to achieve superior energy savings. Through 3D computer simulation energy modeling, the building is anticipated to achieve a 30% energy cost savings when compared to a typical code-compliant office building. The interior includes low Volatile Organic Compound (VOC) emitting building materials, carpeting and furniture for a safe, healthy working environment. All paints and varnishes used in the building renovation were also required to have low VOC content. This contributed to a healthy indoor air quality, which was further enhanced by the installation of partitions that feature gypsum wallboard that absorbs formaldehyde from the air and converts it to a safe inert compound. The overall landscape design was preserved by the design team due to the surrounding residential area. The walking trail was improved, but the same permeable surfaces were used. Parking lot islands were replaced with permeable rocks and plantings to improve water management. Parking lot slope was evaluated and tweaked to prevent ponding. The existing powerhouse was hidden by a green roof system to provide improved aesthetics from the surrounding neighborhood. The landscape design replaced invasive plants with natives and focused on maximizing views from the building to the existing woods while tying into the existing ecosystem. More than 30% of the site is planted with native plantings. The existing pond was restored to deter geese and reduce a potent source of pollution. The site is located in the tributary areas of Valley Creek, so a comprehensive stormwater management plan was implemented on-site, in part utilizing a system that was already in place. The site is equipped with an underground stormwater detention system, infiltration trench, and four rain gardens. The intent is to infiltrate on-site and prevent pollution of local waterways. The company has hosted more than 20,000 visitors since the headquarters' grand opening in October 2015. Tours, accredited by The American Institute of Architects and Green Business Certification, Inc., were developed to share the experience of the building with architects, designers, owners, developers, C-suite decision-makers, students, and future employees. The design team and real estate/project manager are regularly engaged in these events. Multi-comfort parameters and metrics for thermal, visual, acoustical, and air quality environment were assessed and analyzed both before and after green retrofitting. Both instantaneous and long-term field measurement data of the physical environment and multi-comfort parameters were collected at the level of the building as well as the scale of the occupant work setting. Environmental sensors and data loggers measuring temperature, relative humidity, air velocity and air movement, stratified across the different floor levels of the buildings, were deployed over the winter, spring, and summer seasons respectively. In addition, infrared (IR) and high dynamic range images (HDRI) were taken over the course of sampled seasonal days for the occupants' workstations and from their direct view sheds, employing wide-angle and fish-eye lenses to simulate their perspective and field of vision. The different imaging techniques were employed to document surface temperature, mean radiant temperature, and glare indices over the study period. In addition, acoustical attenuation, sound levels, and speech intelligibility measurements were recorded for typical office simulated conditions in the field at different times before and after the retrofit. To evaluate indoor air quality, approximately 15 liters of air was sampled for high-performance liquid chromatography (HPLC) and mass spectrometry analyses, as well as VOC concentrations. Airborne particulate concentrations were measured using a light-scattering laser photometer in the near-infrared light range. Occupants' perspective and satisfaction were collected by employing a series of structured and open-ended focus groups. Each focus group included 10–15 employees representing different job levels and workstation locations. This was followed by administering an occupant survey to the entire employee population before and one year after the move into the green-retrofitted office building. Response to the survey was very high, with 289 employees completing the questionnaire before the move and 320 completing it following the move. Data tabulation and coding were performed on both the physical and human-response data sets. Physical measurements and survey responses were spatially tagged and statistically analyzed using SPSS software. In addition, data visualizations and multi-comfort parameters were computed using a suite of software that spatially analyzed the occupants' visual, thermal, acoustical, and indoor air quality (IAQ) across various locations of the building. By selecting a previously developed site, Saint-Gobain took advantage of existing infrastructure and the local economy. The project features a walking path that circulates the surrounding woods, serving as an amenity to employees and neighbors. There is a fitness center on-site for employees, promoting healthy, active lifestyles. There is also a community garden on-site that is managed by employee volunteers. The company has donated more than 3,000 pounds of organic produce harvested at its community garden to local food pantries.